Implants are the preferred modern treatment for replacing missing teeth. They fuse with your bone through a process called osseointegration. As new bone grows around this artificial tooth root, it becomes a part of your body like your real tooth once was. In the past, implants were placed by using two-dimensional x-rays. But now, our dentists can use three-dimensional data to map out and plan your placement for the best outcome possible. The digitized process makes implants an option for more people than ever before. Investing in a dental implant is a smart way to save on dental care in the future. Why? Because a majority of dental implants last for the life of our patients. It’s almost like having a real tooth all over again. While conventional prosthetics like dentures or traditional bridges gradually wear out, implants have the capabilities to last for decades. All of Your Upper or Lower Teeth at Once — Why settle for conventional dentures when you can enjoy a permanent or more secured prosthesis with the help of implants? 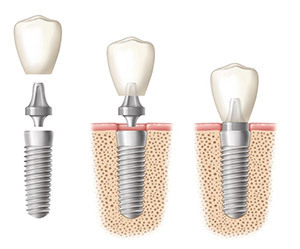 Implant supported overdentures snap into place so that they don’t rock or shift. Or, you can opt for a “hybrid” style denture that’s permanently attached in a way that frees up extra space in your mouth — making them more comfortable to wear. Traditional dental implant therapy is a complex process. Thanks to advanced 3D imaging, our digital guided dental implant providers can surgically place your artificial tooth roots under an hour through a fully digitized process. The computer-guided process allows us to enhance the integrity and precise placement of your implant, so that you can experience the most promising outcome after your surgery. Digitally mapping your surgery prior to implant installation reduces the need for some extra surgical procedures, such as bone grafts or sinus lifts. It also shortens your recovery time and reduces discomfort associated with conventional surgery. In most cases, there are no stitches involved! You can go back to work the very next day. We’ll fit you with a temporary prosthetic to wear while the site heals, then place the permanent crown, bridge, or denture a few months later. Price starts from $1850.00 for impants fixture surgery plus $2500.00 for the implant crown. Private health insurance may also cover part of the cost. Call your heath fund for more information on your personal cover. Comfort Care Dental provides INTEREST FREE dental plans for all general, cosmetic, orthodontic and specialist dental care, making dentistry more accessible to all. At Comfort Care Dental, we partner with MySmilePlan, to offer these interest free finance options to all our patients. Pay from as little as $250/month* INTEREST FREE for Dental Implants at Comfort Care Dental. If you’ve been told that implants weren’t an option, we encourage you to get a second opinion at Comfort Care Dental. Implementing state-of-the-art digital 3D capabilities has revolutionized the way we provide modern implant therapy to our patients. Schedule your digital implant consultation today to learn more.